E. Pettersen, T. Goddard, C. Huang, G. Couch, D. Greenblatt, E. Meng, and T. Ferrin. 2004. UCSF Chimera--a visualization system for exploratory research and analysis. J Comput Chem. 25(13): 1605-1612. Acknowledge Chimera with: "Molecular graphics and analyses were performed with the UCSF Chimera package. Chimera is developed by the Resource for Biocomputing, Visualization, and Informatics at the University of California, San Francisco (supported by NIGMS P41-GM103311)." You may also cite the Chimera home page and the other citations listed (please use the AppCiter button). 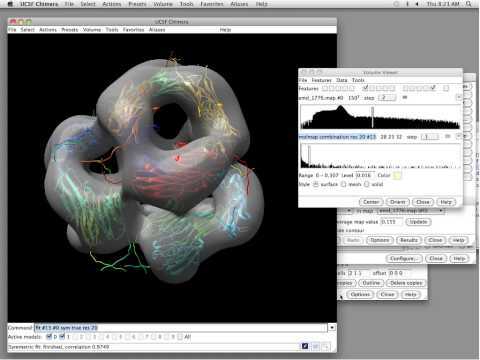 The molecular graphics software called Chimera, written and supported by a team of scientists in Tom Ferrin’s lab at the University of California, San Francisco (UCSF), has been cited over 7000 times and helps biologists and drug developers visualize molecules and biological structures in 3D at various resolutions. The tool has a personal history that traces back to 1994, and an ancestral history that stretches nearly four full decades earlier, to a London lab in 1955 and a man named Robert Langridge, also known as the pioneer of molecular graphics. Bob Langridge. Photo by Christopher Springmann, 1985. Topic: Analyzing Molecular Assemblies with UCSF Chimera"
Thomas Goddard, Greg Couch, Thomas Ferrin, Thomas Ferrin, Conrad Huang, Eric Pettersen.